September 8. Gone Country, making a now rare appearance at a country music club, have made two changes since they last appeared here in 2015. 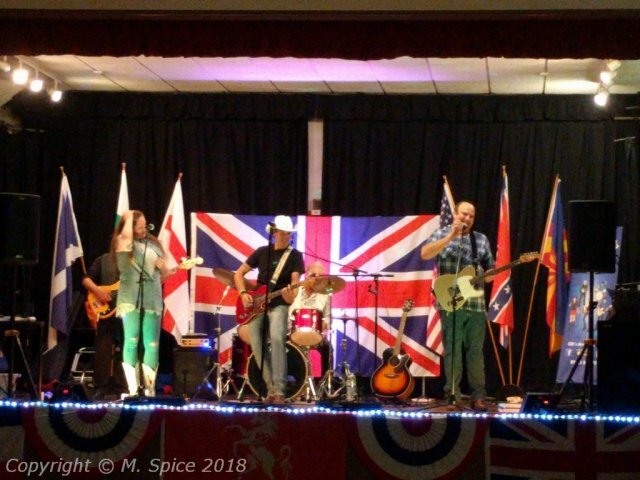 Dave and Chris are the additions and their line-up is now: Stu Edwards (lead vocals and rhythm guitar), James Taylor (lead guitar and vocals), Arwen Bingham (female lead vocalist and backing vocals), Dave Hill (drums) and Chris Robbins (bass guitar). Early on, Stu sang Eastbound and Down as a tribute to Burt Reynolds, who died a few days ago. It was watching films such as Cannibal Run and Smokey and the Bandit, and listening to Jerry Read’s soundtracks, that first got him into country music. Later in the set, after a duet with Arwen (Jackson) our train whistlers participated in Orange Blossom Special which featured Stu on harmonica to end what I thought was a terrific first set to loud applause. The second set started with Stu and James performing Duelling Banjos from the floor. They were happy to accept requests including Red Hot Salsa and a Bruce Springsteen favourite My Oklahoma Home (with the audience singing the “It Blowed Away” refrain). A try at something different was Bad Jokes For Me which Lefty Frizzell used to perform but I didn’t think this enhanced their repertoire. It is, of course, difficult for an act to please everyone and there were some early leavers as putting on a show that broke the usual mould wasn’t everyone’s cup of tea. However, there were many who showed their appreciation with enthusiastic applause at the end - what superb value for just £6.